In USA, May is the "National Stroke Awareness Month", highlighting the need for increasing public awareness of stroke. While prevalent in developed countries, stroke is not uncommon in the developing world. 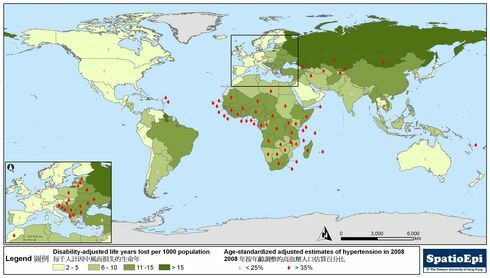 The map shows the global variation in stroke burden (2003) and the prevalence of hypertension in 2008. Uncontrolled hypertension is one important risk factor for stroke. Prevention and proper management of hypertension are therefore crucial in reducing the impacts of stroke on individuals and society. As depicted by graduated colours, eastern Europe, north Asia and central Africa are losing the highest number of life years as a result of stroke. Its association with high prevalence of hypertension, indicated by coloured arrows, is most significant in eastern Europe. The prevalence of hypertension and stroke burden is in fact lower in affluent countries, for example, in western Europe. Insufficient attention to stroke prevention and suboptimal access to effective health care in developing countries have contributed to the observed phenomenon. Stroke is a sudden cerebrovascular disease caused by the interruption of the blood supply to the brain. Ischemic stroke is characterized by the block of brain artery by blood clots whereas haemorrhage stroke is induced by a burst in brain artery. The most common symptom of stroke is sudden numbness or weakness of one side of the body. Other symptoms include sudden confusion, difficulty in speaking, understanding speech or seeing, loss of balance or coordination, dizziness, severe headache without known cause, fainting or unconsciousness. Apart from hypertension, advancing age, hyperlipidemia, diabetes, smoking, excessive drinking, obesity and lack of physical activity are risk factors for stroke. A healthy lifestyle incorporating smoking cessation, weight control by a balanced diet, and regular physical activity are important means of preventing stroke. For patients suffering from stroke, medical treatment and rehabilitation are important to enable them to return to normal life, often with the support of family and friends.